Register Log In ECN Forum Forums Re: Computers and the Internet What file format should I use? Can I please pick your brains. I'm sure someone here knows the answer to my query. I have about 3500 songs on this computer here, I would like to burn a couple of CD's to use in my car. What file format should I use so that the CD player in my car can play these audio files? I tried burning a disc the other night using Windows Media Player 10 (I have no intention of upgrading any further) and the CD player rejected the disc. You can use WMP 10. just right click on BURN and select audio CD not data CD Most older auto CD players will not play MP3 or WMP formats. All will play Audio CD format. Old "CD" players need to be fed CDA files. That is the "audio" from a burner program, not "Joliet" data disks. If you get a player that reads MP3 and other formats you get a whole lot more on a disk, about 10x. I use MP3, any media players will see them. My wife's Lincoln even has a USB port to plug a thumb drive into, and so does the new JVC in dash player I put in the truck (Crutchfield.com $129). I still have the PC in my Honda. Retired Helper and WESTUPLACE, thanks a million guys for your help. I don't actually want real songs on my car stereo, what I was looking to do was listen to the audio tracks from my drumming at the local theatre. I've been a drummer for close on 20 years and anything I can do to "lift my game", as it were, I'm all for. Could be a missed beat or a bad hi-hat pattern at some stage of a song, any true musician always likes to keep mistakes to a minimum, drummers have the problem of having to use both arms and legs to play a drum-kit proficeintly(sp?). I record my playing to an MP-3 recorder and put it on my computer from there, I can't interface the MP-3 thing with my car stereo, which is a shame. My drum-kit is pretty much acoustic, although I do have a Roland SPD-20 pad unit, for effects and what-not. I've also taken the 2nd kick drum and pedal out too, it was more of a nuisance than anything. Love that picture of your Drum Kit!!! Is the Hi-Hat set on the Right (under the China Type Cymbal) a "Remote" or "Fixed"? "Remote" being pedal controlled for opening. 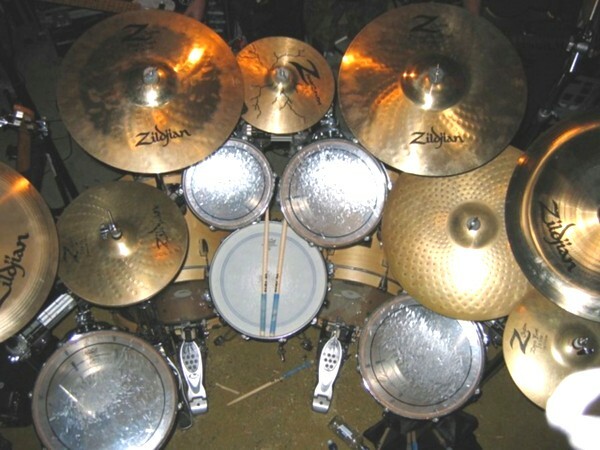 "Fixed" being a Hi-Hat set placed on a Cymbal Stand, which are set only via the Clutch. That little Splash Cymbal in front is cool! I like your idea of recording your Practice and Rudiments. Something with high capacity (up to 120 Minutes recording length), with ease of control at the kit (without leaving the throne) would be great!. Maybe you could supplement this with a multi-setting / rhythm Metronome, and write out a variety of Rudiments + Practices to follow the Metronome. I used AutoCAD to compose 3-staff Drum Music for Practice usage, but I am sure MS Word could be used instead. The right hand hi-hat is a remote type, the pedal is hidden by the floor tom on the left of the kit. I've never really understood the reasoning behind the "fixed hat" idea, if I'm going to have two hi-hats, they need to be able to be controlled with foot pedals and my left foot. Regarding that splash cymbal, some clown drew those cracks on it with a Sharpie pen. I have Luke (our sound guy) record the audio from my drum kit at the mixing desk as MP3 files, it saves me having to muck around with starting and stopping the recorder (when I remember). We use Reaper to record our practice sessions using 10 tracks in. I mix them later, render to mp3 and upload to our practice page so we can all wince at the horror at our leisure. It can also render directly to CD but I haven't needed that yet. Best thing about Reaper other than the comparable performance to very expensive pro software is its price. $60 if you don't make more than $20k a year using it. $255 if you do. I usually have the whole kit miked up and a local mixing board that I built myself, feeding the "Snake" that feeds the main mixing board. I might have a look at that Reaper thing, if it makes our life easier, I'm all for it. I remember when I was back in High School, playing in the school band, they tried recording the sound from us playing during a practice with one of them mono-aural tape recorders, that were big in the 70's and 80's. There was a problem with the snare drum being out of time with the rest of the band. I tried to explain that it was caused by the sound coming out of the bottom of the drum and the electret mike on the recorder being too far away from the drum set. Oh well, it was a good experience. I should have mentioned that what I do is take those mp3's and put them on my Garmin Nuvi 660. It transmits over the radio, plays mp3's, answers my phone calls(while automatically pausing ant mp3 currently playing) and gives directions (also pausing the file player). All I do is dump them on an SD card and put it in. The media player finds them. I do have to edit the meta tags to get stuff to sort the way I want. I use MP3TAG. Free (though I made a donation).